Targeted therapy is one way in cancer treatment aimed at the specific process of cancer cell growth, cycle life (in some cases also on the blood vessels that feed tumors). 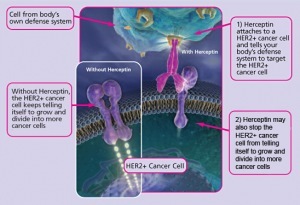 Targeted therapy for breast cancer include: HERCEPTIN, AVASTIN, TYKERB, IRESSA. 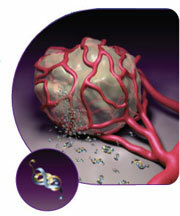 Each drug works specifically in cancer cells. 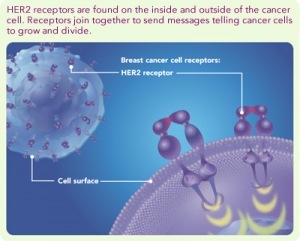 Differences of targeted therapies with standard therapy (surgery, Chemotherapy, Radiation) is that they are only on targeted therapies focus on a specific molecule led to the development and spread of cancer cells. While on the standard therapy, healthy tissue is also affected by the administration of the drug. 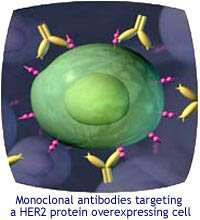 Targeted therapy can be used alone or in combination with chemotherapy drugs to obtain effective results in the signal blocks the growth of cancer cells. Our bodies consist of cells that grow, die and divide to make new cells we need. Cells that are older will die, new cells take their place. In cancer, there have been changes in the normal process of cell formation. On the formation of cancer cells, too many new cells are formed, whereas the old cells do not die as they should. 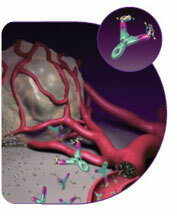 Groups of these extra cells will gather in one place, into the tumor. 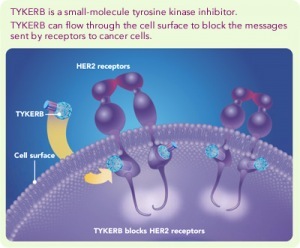 • Herceptin & TYKERB: Attacking receptor-HER2 receptor which resides in cancer cells and blocks so as not to receive signals that instruct cells to divide.